The Harrison County Sheriff’s Office utilizes K-9 Patrol dogs in several divisions within the agency. Typically Belgium Malinios, German Shepherds and Labradors are used as service canines. These highly trained canines are used in protection, Narcotics detection, search and rescue and the apprehension of a fleeing suspect. The Sheriff’s Office has one Labrador assigned to the School Resource Division trained in detection tobacco and tobacco products. 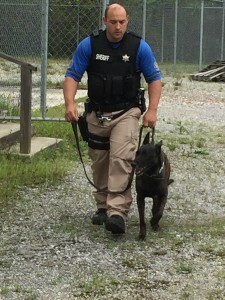 The Harrison County Sheriff’s Office K-9s are trained with their handlers who are required to pass a certification test which meets state certification standards universally accepted in Federal and State law. These K-9/handler teams train regularly and must maintain standards set forth by the Harrison County Sheriff’s Office. The K-9/handler teams are credited with saving the lives of numerous missing adults and children along with tracking and apprehending dangerous criminals each year. In Law Enforcement around the country, it is a proven fact that K-9 Patrol dogs are a valuable asset to Agencies everywhere.